Membrane proteins, particularly G protein-coupled receptors (GPCRs), are notoriously difficult to study in terms of structure and function. Despite extensive exploitation of GPCRs as therapeutic targets, biophysical characterization of GPCR-ligands remains challenging. This application note describes how MicroScale Thermophoresis (MST) facilitates the fast and precise determination of the equilibrium binding affinity between the GPCR CXCR4 (human chemokine receptor that is targeted by HIV) and an IgG antibody. Furthermore, the application note underlines the ability of MST to study this interaction in serum. MST is based on the movement of molecules in temperature gradients. This movement (thermosphoresis) depends on the size, the charge, as well as the hydration shell of a molecule and is thus affected by molecular interactions, for example the binding of a target and a ligand. 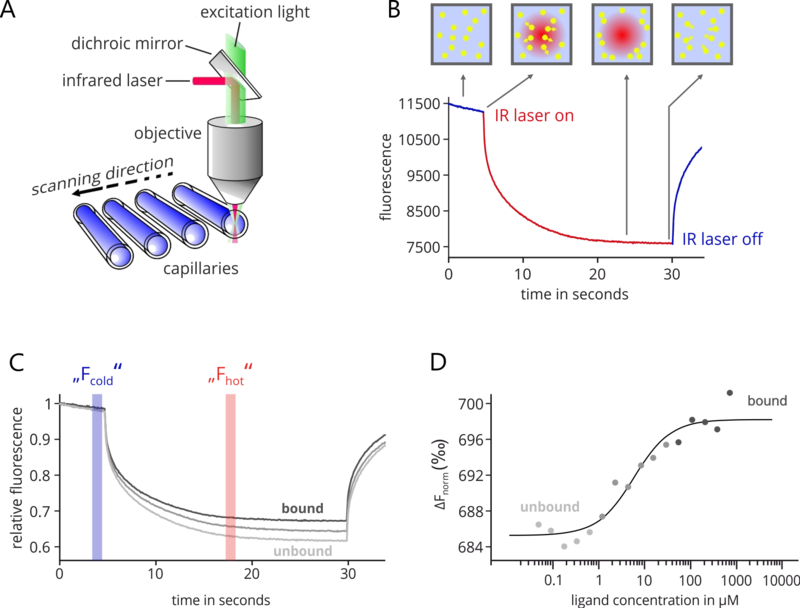 In MST, a precise temperature gradient of 2-5 K is generated within very thin glass capillaries by the use of an infrared laser (Figure 1A). The thermophoretic movement of the interacting molecules is then tracked by fluorescence (Figure 1B). In order to be able to track the molecules, one interaction partner has to be labeled with a fluorescent dye, or alternatively, its intrinsic fluorescence can be used (label-free). Figure 1. Technical setup of MST and example data. Finally, a typical binding isotherm can be calculated from multiple thermophoresis traces generated at various concentrations of the unlabeled ligand (Figure 1C, D). Figure 1. Technical setup of MST and example data. A strongpoint of MST are intrinsic quality controls with respect to sample aggregation and adhesion tendency. In this example, the MST traces (Figure 2A) show no sign of sample aggregation (bumpy, unsteady traces). Also, a horizontal scan of the glass capillaries (Figure 2B) shows a homogeneous fluorescence distribution, which indicates no sample adhesion (sticking) to the glass surface. The MST data of two independent experiments agree nicely (Figure 2C) and the binding isotherms can be fitted with a KD-binding model to yield an affinity of 1.7 ± 1.0 nM in buffer and 15.0 ± 9.0 nM in 50% serum. Figure 2. MST quality controls and binding isotherms for the GPCR CXCR4 and a mAB in buffer and in 50% serum. Data points and error bars represent the mean and standard deviation of two independent experiments. MicroScale Thermophoresis (MST) is a suitable technology to study GPCR-antibody interactions. 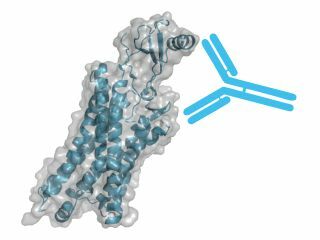 Steady-state binding affinity between GPCRs and antibodies can be determined in buffer as well as in bioliquids such as serum.